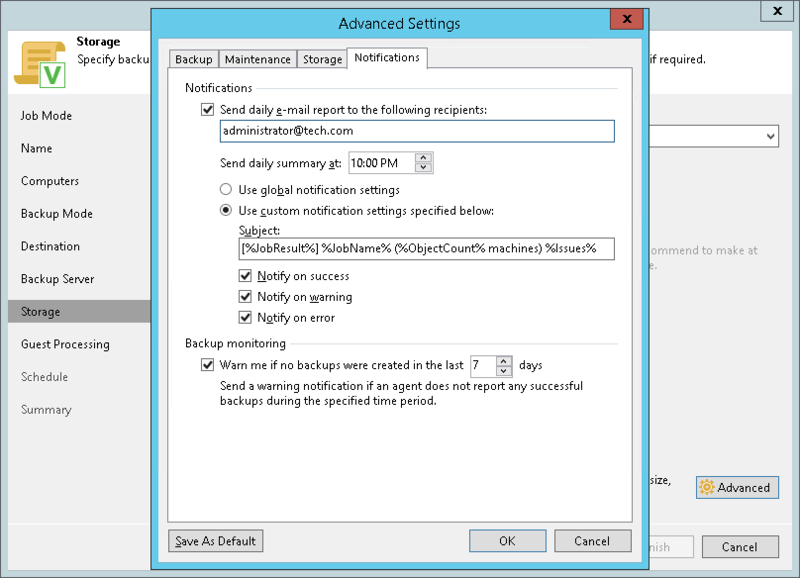 You can specify email notification settings for the backup policy. If you enable notification settings, Veeam Backup & Replication will send a daily email report with backup policy statistics to a specified email address. The report contains cumulative statistics for backup job sessions performed for the last 24-hour period on computers to which the backup policy is applied. Email reports with backup policy statistics will be sent if you configure global email notification settings in Veeam Backup & Replication. For more information, see the Configuring Global Email Notification Settings section in the Veeam Backup & Replication User Guide. After you enable notification settings for the backup policy, Veeam Backup & Replication will send reports with the backup policy statistics to email addresses specified in global email notification settings and email addresses specified in the backup policy settings. Local Storage — if you have selected to save backup files on a local storage of a Veeam Agent computer. Shared Folder — if you have selected to save backup files in a network shared folder. Storage — if you have selected to save backup files in a Veeam backup repository. Select the Send daily e-mail report to the following recipients check box and specify a recipient’s email address in the field below. You can enter several addresses separated by a semicolon. To receive a typical notification for the backup policy, select Use global notification settings. In this case, Veeam Backup & Replication will apply to the backup policy global email notification settings specified for the backup server. Veeam Backup & Replication will send the email report containing backup policy statistics at 8:00 AM daily. In the Send report at field, specify the time when Veeam Backup & Replication must send the email notification for the backup policy. Veeam Backup & Replication will sent the report daily at the specified time. In the Subject field, specify a notification subject. You can use the following variables in the subject: %Time% (completion time), %JobName%, %JobResult%, %VmCount% (number of computers in the backup policy) and %Issues% (number of computers in the backup policy that have been processed with the Warning or Failed status).